A sabtuan (traditional Cree shelter) in Moose Factory. On July 20, 2016, Sean Fraser from the Ontario Heritage Trust interviewed Bob Sutherland about his experiences and travels reconnecting with Cree relations in the Rocky Mountains. Sutherland has discovered that many James Bay Cree traditions devastated by the residential school system more than 140 years ago have been preserved in Alberta and Montana by Cree descendants who are providing a means of recovering language, songs, ceremonies and important spiritual knowledge. Sean Fraser: Tell me about the importance of language to the Moose Cree in understanding and connecting to the landscape of the James Bay area? Bob Sutherland: That’s a very good question. One of the things that is very important is language. People don’t fully understand that culture is language and language is culture. And that's what's lacking in a lot of young people today – not only young people. My wife and I talked about this and we both agreed that we did not speak enough Cree to our grandchildren. All of our children actually speak the language, but our grandchildren don’t and we are both at fault for that. There are some sacred sites that are very important in the James Bay region, and the people who know of these places only know them in the Cree language. The language of these places is significant to our culture. Sean: How would you describe the relationship between the Moose Cree and the land itself? Bob: Well, lately I guess, young people today are very interested in knowing the spiritual part of life. A lot of young people are searching. For us in the James Bay area, people call the land Mother Earth. The earth is our mother and our part mother, I should say. All the people up here are related to one another; and want to be connected in one way or other. The thing is, changes are coming quickly. For example: mining and forestry. The people in coastal communities are still very attached to wildlife, the food, the moose, the caribou. In fact, I’m cooking caribou right now. And geese – they’re a staple, too, and a very important part of our culture. That’s what’s happening to us in our communities. We’re still attached to the traditional foods. It’s also popular because of the great expense up here for beef and chicken and other food from down south. Sean: Could you explain what was lost in the connection between the James Bay Cree and the land with the arrival of the residential schools? Bob: So, in Moose Factory, there was what they call the Anglican Church and what we used to call the Wesleyan Church way back in the 1700s, who also came to the James Bay area. I’m not sure about the exact date they started, but the Anglican Church started a boarding school in Moose Factory, way before any government-run residential school. Even though it’s a long, long time ago, the language is still very strong in the coastal communities, though maybe not as much in Moose Factory. Myself, I’m fortunate to speak the Cree language, but what was lost along the way was the spiritual part of the Cree people – like the sundances, the long lodges, teaching lodges, fasting lodges and the sweat lodges. The structures and buildings are there – like the sundance structure is still there – but what’s lacking is what used to be there. 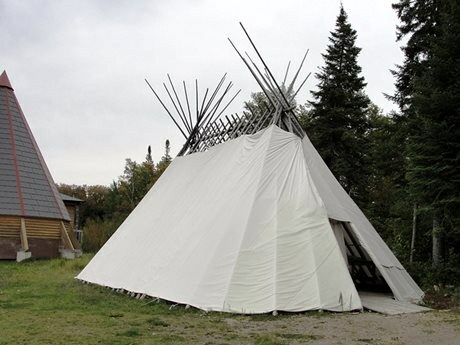 Same thing with the sabtuan [a traditional Cree shelter] located in front of the Ecolodge in Moose Factory. That site used to be a ceremonial place. A lot of people don’t know that it used to be a place for the ghost dance feast where people have gone to the spirit world. These ceremonies were lost to residential schools. Sean: It sounds like the ceremonies were closely connected to specific places. They weren't just general ceremonies, but ceremonies rooted in the landscape. Sean: Do you think many ceremonies would have been lost if these Cree hadn’t run away to the west? Bob: Yes that's exactly why they took off – because they didn’t want to lose what they said to me that god gave them. And I’m not the only one now that knows this story, but I was one of the first to learn about these people running away. Sean: Tragically, it would seem that they had to leave the land to save their connection to it. Bob: Well, see, the songs are a connection to the land. You know, no matter where you go – like, let’s say you’re in Alberta or you’re in Ontario – the same meaning of spirituality is there: Cree, Ojibway, Blackfoot – they’re all the same. The Blackfoot have the same songs as we do, but they sing them in their own language. Sean: What steps have you taken to try and recover this knowledge and these connections? Bob: Well, what I have done is to travel every year to the communities that I mentioned. This year was the second time I went to Rocky Boy (i.e., the Chippewa-Cree Reservation in Rocky Boy, Montana), but this time I made a connection with somebody there and I told them the history that I knew of their running away from Ontario. And they said, “Yes, this is exactly what happened. We are those descendants.” I always wanted to check in with them, like in Rocky Boy Montana. I just wanted to check what the elders have told me that this one particular family decided to stay there. They didn’t want to travel anymore. So, I went back there three years ago and that’s when I met the people. We spoke but I didn’t get an opportunity to sit down and actually talk with people. And when I did, they spoke exactly in our Cree language. It’s just amazing. It just blew our minds. I said to them, “That’s what I was trying to find! That’s why I went over there. I wanted to find out the truth of the story.” Sure enough, they call themselves Chippewa-Cree, and they sound exactly like us up here in James Bay. Sean: Their dialect was James Bay Cree, but an older form from maybe 100 years ago. Bob: More like 140 years ago. That's when they ran out. You know, before the Indian Act (1876). When I started doing this history, I always wanted to prove it to myself before I started to bring it out in the open. I had to find the truth to see if this was real. I didn’t want to say anything to anybody, but I had been talking to people here in James Bay and also in Sunchild who express the same interest and knowledge of reviving our culture. So, now we go there. They know that we are from Ontario, and they know and recognize us. And they even say in Sunchild that these people – us – came from Ontario. These people are our relatives, which confirms our relationship with them. That’s why I go there every year. Sean: When they moved there, they must have found support from other First Nations. Bob: See, what was happening and why Crees end up so far away in the west is when the Hudson’s Bay Company started building its empire to the west and the Crees were paddling them up into the interior. So, if you come to Fort Albany or to Moose Factory, the Hudson’s Bay Company built posts as they went. And then, a lot of times, the Cree just said, “Oh, let’s stay here or there.” But the ones that ran away in 1873 had a different purpose for running. Not like the Hudson’s Bay Company guides that went up country. That was an economic thing. But for these other people, it was more of a spiritual thing. They didn’t want to lose the spiritual part of their lives. Bob: Yeah, their identity. That’s what the biggest and most important thing is to the youth. They are very interested, but I always tell people to do their homework. Do your research. Find out about the people coming into the communities. Where did they learn what they learned? You know, I’m probably not the only one. There are others now that go out to the mountains. There are some people going out there on the first of August to Alberta to do fasting. And I don’t want everyone to go there. I just want the people that are meant to go there to go and to find what they are looking for. Sean: Do you find that more and more young people are reconnecting with the Cree in the west? Bob: Yes. Yes, a lot of young people are starting to look to the west and say to me, “Can we come with you?” Now, I never go around and tell people that I’m going out west on these trips. I just think if they wanna come, they’ll ask me, right? That’s how I look at it. If a person – even my own children – were to ask, I might just say, “Well, I’ve been waiting for you to ask.” You have to make up your own mind. If I make up your mind for you, it’s not going to work. Sean: Sounds like it’s really important to be accurate with your information, to understand the ceremonies and knowledge and make sure that what people are acquiring is authentic. Bob: Yes, that is a very important thing. I can’t stress that enough. You know, when you want to find something pure, if you want to find something that’s real, you have to do your homework. When I started searching many years ago, I was fortunate that I met an elder who lived to be 110, and he took me under his wing. He knew that I was looking for truth. He even told me that if you want to help your people, you gotta know what you’re talking about. If you don’t know what you’re talking about, you’re gonna hurt your people. Sean: Are you considered an elder in your community? Bob: No, not really. There are a lot of people, like the younger people, who look up to me. But with people my age, they just call me Bob. I don’t go around and be Mr. Know-it-all. But if somebody asks me something, for sure I will give them what I have been told over many years. I’ll tell them what’s straightened me out in my life and what happened to me as an individual. I think about finding these people and about the people finding me. Sometimes, I wonder if it’s me or was I chosen to find them. I don’t know, but it’s very interesting. Sean: How did you personally come to learn about the land where you live in Moose Factory and your people's connections to it? Bob: Well I guess as a young child I had humble beginnings. We didn’t live in Moose Factory. We lived about 10 miles upriver. In Moose Factory, they had the store, the hospital, the school. But before I was taken away at age 7 for residential school, we grew up in a totally unique environment. We grew up on the land. As a young person, I had familiarity with the land. I remember I used to snare rabbits with my aunt – I was probably the youngest of the group. And we set fishing nets. We used to paddle. We didn’t have enough money, I guess, to buy an outboard motor. So, our surroundings – our areas, like, to go get fish, partridges, rabbits, to go get wood – it was all very familiar for us. These were daily chores. We always had fresh fish and we were very fortunate. There were only about 10 families on the Old French River Reserve – the original reserve that was created in 1905. That’s where we grew up. There were no vehicles and there were no roads, per se. You know, it was a very unique environment. We had radios, but no TV or anything like that. So, I think we were closer to the land, closer to the environment, and we knew that it fed us. That’s something that we didn’t see in the store. In Moose Factory, there was the store and people were always getting food. Compared to us – we had to go find our food. I think that’s where I learned about the spiritual connection and the importance of the land, the importance of the air, the importance of the sun, the importance of the water. You know, all these natural things that we don’t have control over. But they control us, in a way, because if I don’t have air I won’t survive. The water was always fresh and clean upriver. So, normally with the environment fresh and clean, us human beings will be fresh and clean as well. Sean: How did you stay connected to the land after you were taken to residential school? Bob: I think I was in residential school for 10 years. But I already had my connection with the land and every summer I would go back to the land where I was raised to reconnect. You know, even today I have a house up there and I still go back to sit up there and relax. I go up in the winter time to cut wood. Now, people go up there to fast, so it’s a lot different. It’s become a ceremonial ground, a lot different from my childhood and from my grandchildren’s childhood. Things are a lot different now on the land. Bob Sutherland is a Moose Factory resident and Moose Cree elder.